Replaces old part number 091-026625. Pinion Gear for the transmission. 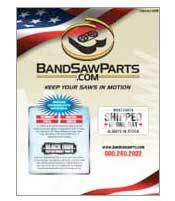 Fits horizontal saw models C-69,C-70,C-80 & C-1216. Replaces old part number 090-219445. Bull Gear for the transmission. Fits horizontal saw models C-69,C-70,C-80 & C-1216. DoAll TF 25 band saw Transmission shaft. This is the output shaft that the Drive Wheel Mounts on for this Model DoAll. Bearing* These are the Bearings needed for the DoAll 095-116216 Outlook Shaft.